Happy New Year 2016 to all of you! 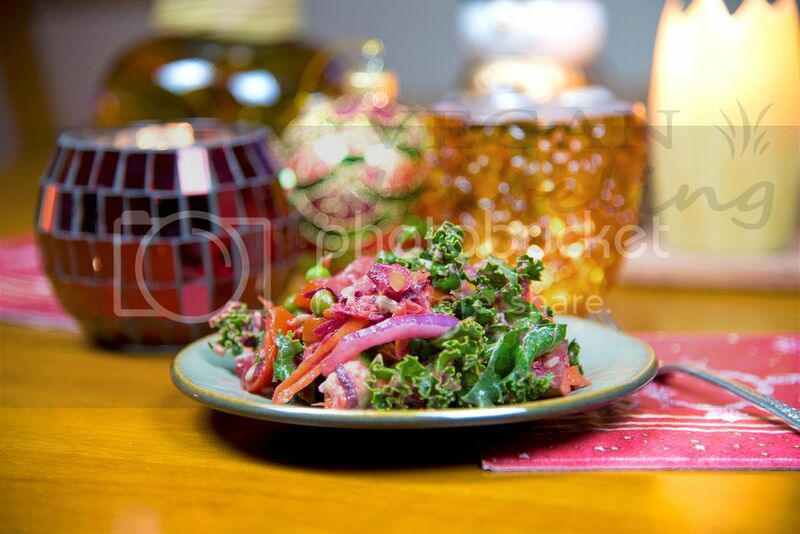 Wishing you merry holidays, happiness, health and plenty of raw veggies and fruits on your festive table! 😀 Even if you’re not a fully raw vegan, you can always just include a couple raw dishes for the seasonal celebrations, as well as fresh berries, fruits and smoothies. 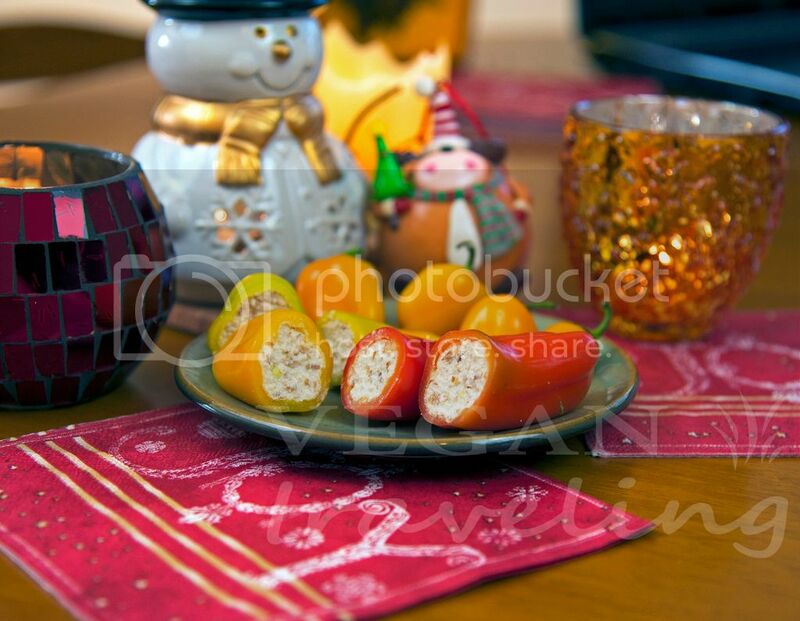 They are so bright and colorful and will make any festive table beautiful, along with keeping you healthy and lean throughout the holidays season. Our celebration this year included raw berries, raw cheese stuffed peppers and a super delicious festive beet salad. 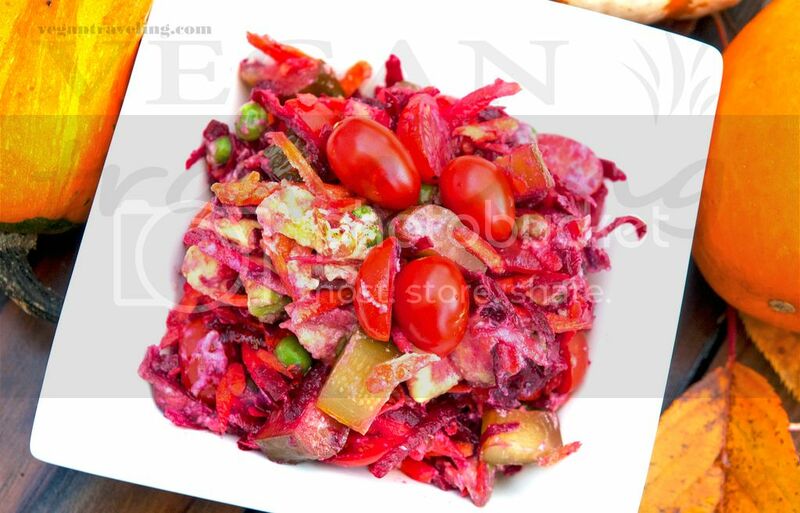 The salad has a variety of flavors and textures which is so diverse and yummy that you’re guaranteed to stay away from any non-vegan/cooked foods during your holiday dinner! 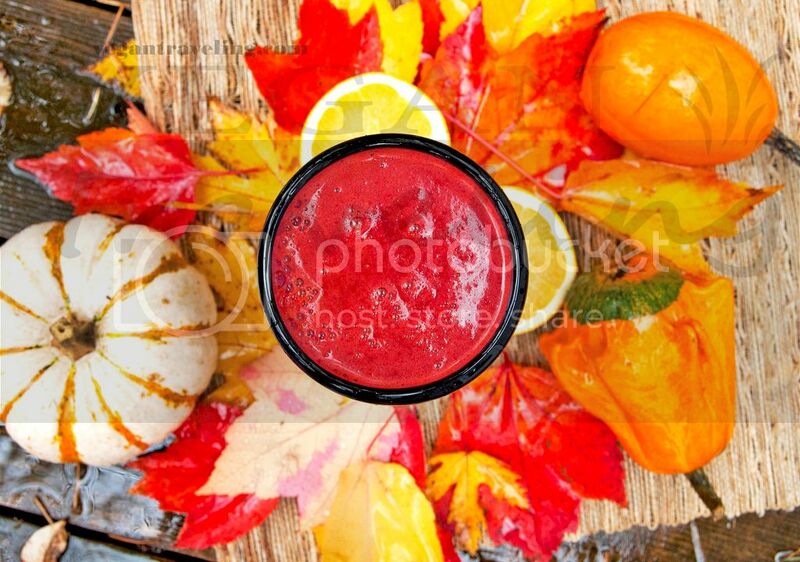 You’ll be amazed at how delicious raw beet tastes in this blend. Give this salad a try, it might well become one of your festive recipes staples. Wash kale, remove and dispose the stem, chop kale and add to a large bowl. Peel carrot and beet, then shred them on a large shredder. Slice tomatoes, mash avocado, slice pickled cucumbers. Thinly slice red onion. Defrost green peas in warm water, changing water couple times. Add all ingredients to the bowl with kale and dress with oil, lemon juice and salt. Mix well and serve! Happy holidays friends! 🙂 This Christmas and New Year’s eve I’m making this amazing raw vegan snack – almond cheese stuffed peppers. The recipe includes two steps – making almond cheese and then stuffing the peppers. Although the preparation for both of these steps is really quick, the soaking of almonds and then cheese fermentation take about a day each, so make sure to plan accordingly. Soak the almonds overnight (this step should ideally be included, but if you’re short on time and have a high-speed blender like Vitamix you can omit it). The next day rinse the almonds well and drain the water. At this point you can peel the almonds, which is very easy to do when they’re soaked. Or you can leave the peel on which doesn’t affect the taste much. Add almonds to your food processor (I usually use Hamilton Beach) along with lemon juice and salt. Start blending, adding water bit by bit – the less water you use, the better will be the result. After the mixture is very well blended into a thick paste, wrap it into a cheesecloth (folded 4 times) and give it a squeeze to remove most of the liquid. You can drink the liquid – it actually resembles ayran and tastes pretty good. As for the cheesecloth wrapped almond mass, place it into a large strainer over a deep dish and leave for 24 hours to ferment. In a day, you’ll get your raw almond cheese. If you follow all of these instructions you will get a soft crumbly cheese similar to ricotta. Mince garlic and add it to 1 tbsp of almond cheese, along with olive oil. Mash the cheesy mixture with a fork. Remove top of each pepper and then stuff it with the cheesy garlic mixture using a teaspoon. Place the stuffed peppers into a fridge for at least 30 min. Then slice the stuffed peppers and serve. With all that said, kale is also very low in calories, so while filling up with all the healthy vitamins and nutrients you won’t be gaining unwanted weight. All this is making kale a truly miraculous food, that is why we should include it regularly in our meals. Wash zucchini and kale. Slice or tear kale into smaller pieces. 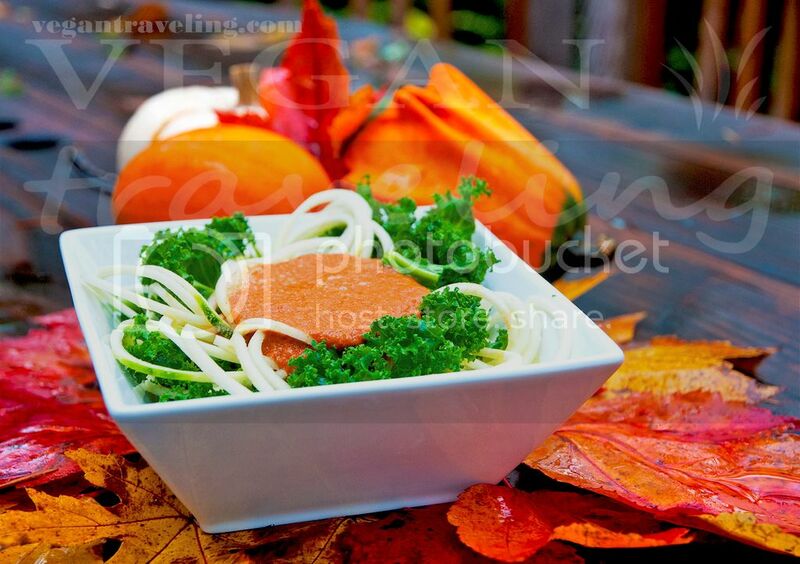 Spiralize zucchini using Tri-blade Vegetable Spiralizer. Dress with this super delicious and simple marinara sauce. As farmers markets close for the season and availability of fresh local fruits and veggies diminishes, I always am starting to crawl back onto greens and roots based salads. In fact, the main ingredient in these salads that keeps me staying raw vegan are specifically root vegetables. These kind of veggies – carrots and beets in my case – are extremely satisfying and what’s most important about them is that they feed our good gut bacteria and promote its further growth, which in turn provides us with vitamins, protects us from pathogens and keeps us active and healthy. That is why if you’re feeling hungry, depressed and unsatisfied during the Fall months, after the abundance of Summer is over, make sure to eat plenty of root vegetables. Carrots, beets, turnip are all very delicious by themselves, in salads, in juices and are also very inexpensive and largely available throughout the year. 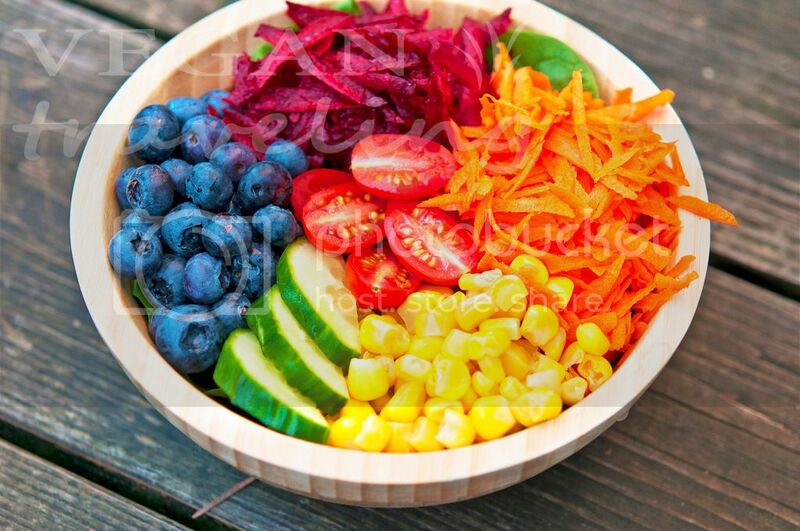 This time I made a rainbow salad with greens, roots and berries. Wash and peel beet and carrot, then shred them. Slice cucumbers and tomatoes, defrost corn in warm water. Place baby spinach leaves on the bottom of a bowl and then arrange rest of the veggies on top. Dress with freshly squeezed Meyer lemon juice. The dark blue color of blackberries indicates that this berry contains one of the highest levels of anti-oxidants of all fruits! 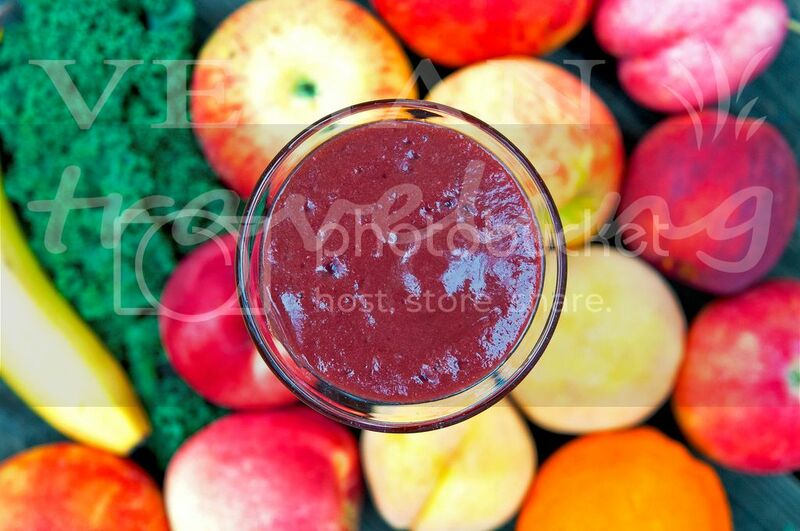 Enjoy your Wednesday and don’t forget to fill up on delicious fruits and veggies in abundance! Wash all ingredients. Peel the orange, remove core from apple. Cube larger ingredients and add everything into a high speed blender like Vitamix. Mix on high speed until all ingredients are well blended. Pour into tall glasses and enjoy every sip! More peach smoothies for me each morning! I still have plenty of frozen peaches from a farm in WA, so enjoying local peaches in my smoothies even in the thick of cold weather. Smoothies are super easy to make, literally it takes me just 5 min to mix one up! They are also very delicious and the benefits of having one every morning are amazing! Improved digestion, increased energy, great source of vitamins and nutrients are just a few benefits to mention. 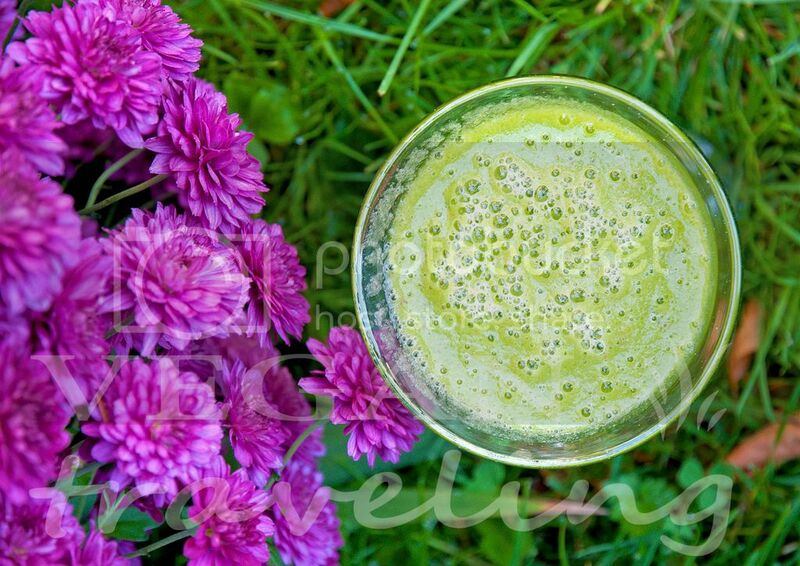 Give this concoction a try and I guarantee you’ll love it!